All around the Sol Friedman House at 11 Orchard Brook Drive in Pleasantville, New York, country roads wind through forests and meadows and the homes–three designed by Frank Lloyd Wright himself, the rest approved by Wright and built by noted architects of his choosing–that make up Westchester’s 1947 Usonian community of 50 houses blend perfectly into the landscape. None can be seen from the nearby highway that makes the Usonia Historic District a mere 50 minute commute to Manhattan. Documented by architectural photographers and featured in numerous publications, the Friedman house is indeed an extraordinary masterpiece, one of the three designed by the master architect–and it can now be yours for $1.5 million (h/t Curbed). 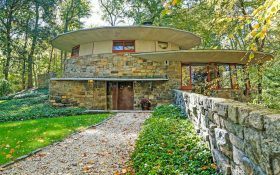 The home’s overlapping circular masonry design brings structure and nature together in one of Wright’s celebrated signature styles–one which would be seen before long in the design of Manhattan’s Solomon R. Guggenheim Museum.